Psst – real pans get food on the sides when you cook with them. 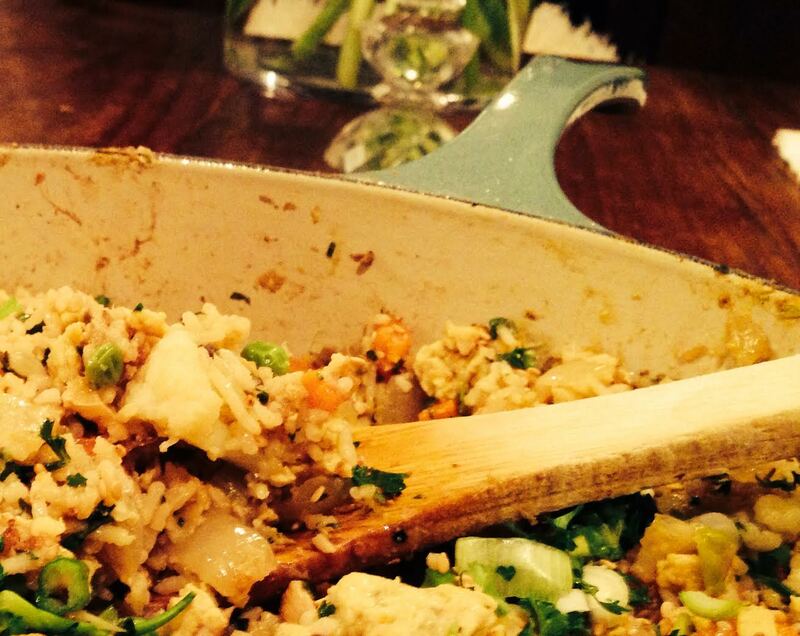 Fried rice variations are endless and should be tailored to your new anti-food-waste needs. The last batch I made (pictured above) featured in addition to the big 5, a languishing half head of cauliflower, onion, carrot, celery, frozen peas, mushrooms, leftover chicken salvaged from an unfortunately flavored Tom Yum soup delivery, green onion, sesame seeds and fresh parsley. Though my children would have sneered at several of those ingredients alone, as a family we crushed that batch of fried rice, and avoided paying for an additional meal for five in the process (now you see why it’s more like magic?). If you are using onion, carrot, celery or other fresh veggies, dice them while heating some peanut oil (enough to coat the bottom) to med-high (shimmery but not smoking) in a large enameled or non-stick deep sauté pan (or wok if you have one). Add a couple drops of sesame oil, then sauté and season your veggies. Softer vegetables such as cauliflower, broccoli, and zucchini, if used should be added/seasoned a few minutes later, and cooked with the lid on. Once veggies have reached desired doneness, push them to one side of the pan. Add a few more drops of both oils to the pan and once heated, crack the eggs directly into the clearing. Season them with salt, pepper, and coriander. Break them up to cook. Stir cooked eggs into veggie mixture. If pan has lost it’s oil coating, add a bit more. Dump rice into pan, drizzle conservatively with soy sauce (you can always add more later). If rice is cold from the fridge, cook covered for a few minutes to soften, adding a few drops of water to rehydrate grains if necessary. Add meat and frozen peas, stirring to combine. Fry mixture until peas are done. Before serving, taste the rice and adjust the seasonings. Garnish with fresh herbs and sesame seeds. FTW!